One blog in and you probably already think I’m a pessimist. But I’m not. I’m truly not. Today, I bring you good news. That good news is contained in the chart below: a list of all the major commodities whose prices have fallen by more than 10% over the last twelve months. That’s fishmeal and oranges. Maybe you don’t eat a lot of fishmeal but perhaps you own your own fish farm, in which case the cost of your product is going to come down nicely. And you can cook nice stuff with oranges and fish. Here’s a nice recipe for pan-fried trout with an orange hollandaise. Or maybe you prefer salmon with an orange-and-ginger glaze. That too is a recipe which has come down in price over the last year. Good news for every citrus-loving piscaphile. That would be crude oil, diesel, gasoline, natural gas, jet fuel, heating oil, tea, coffee, wheat, rice, maize, barley, beef, pork, shrimp, soybeans lumber, hides, wool, iron, zinc, tin, uranium – and literally dozens and dozens of other commodities. I’m not even going to give you a list of stuff you can cook, build or fuel with these commodities because you just have to look around the room now or out of the window, and you can see it for yourself. (Just block out any fishmeal and orange trees.) Remember that the commodities in this list haven’t dribbled up in price, they’ve soared in price – some of these items by 80% or 100%. So inflation is a problem. That won’t be a surprise to you. Every time you put fuel in your car or buy groceries at the store, you’ll notice the problem. Only, and here’s the thing, our politicians and bankers don’t seem to care. Interest rates are at rock bottom levels. And they’re printing money. They’re printing it in America. They’re printing it in Britain. They’ve been printing it in Europe. All this should come as no surprise. The bonehead ivory-tower academics who run the Fed are fixated with academic theory. In the real world, we know that if you trash a currency – the currency which all world commodities are priced in – prices will go up. This reckless currency debasement can only end one way. Raging inflation. The money presses hot from printing. 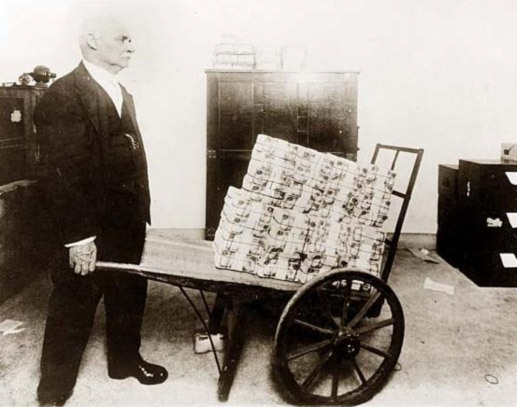 In 1923, it turned to hyperinflation in Germany. More recently, it turned to hyperinflation in Zimbabwe. That wouldn’t be money on that wheelbarrow, would it? Everybody needs to wake the hell up and all need to get off the Dam Fiat money Standard.